As the “old man” of Growing Up Disney, I’ve been to Walt Disney World way more than any of our main contributors. My first trip was to the Preview Center before WDW opened in 1971. So with this many trips “under my belt” I, along with Mom, have had lots of practice preparing for our “next” trip. We don’t have any small children to worry about getting ready or packing all the things needed for a child on a trip. Just two old “pros” going to WDW. Once reservations are made, the next step is planning where to eat!!! Some trips it is all counter service and just taking our chances on a table service restaurant. Other trips we decide what restaurants we want to eat and plan our trip accordingly. If you are on the Disney Dining Plan, this step is an absolute must. It is “SOP” (Standard Operating Procedure) for us to plan what parks we are going to visit based on where we want to eat. Once we decide where to eat (usually lunch) we make reservations at first opportunity but always remain flexible as some restaurants fill up quickly. One restaurant we always include is Olivia’s at Disney’s Old Key West Resort. OKW is our DVC Home Resort and eating at Olivia’s is just part of “being at home”. Travel is usually not an issue as we normally drive to WDW. No worry about flight schedules, catching DME, or renting a car. We have flown but keep coming back to driving. On one trip when we flew, airport delays made the trip longer than if we had driven. If left to its own devices, my car can find its way to WDW almost on its own. I set the GPS just so it keeps me from missing a turn and I don’t have to concentrate on directions. Just keep an eye on traffic and enjoy the trip. Packing for the trip is a non-issue too. Mom and I have been so many times that packing consists of checking the weather at WDW for several days leading up to our travel day. Once we are aware of the weather, packing usually takes us about 15 minutes each and is completed the evening before we begin our trip. Load the car and we are ready to roll. Staying in a DVC resort means we have a full-sized washer & dryer in our room, so we don’t have to over pack. Clothes are easily washed and normally when we come home our clothes are clean when we pack up. So how do we “prepare” for at trip to WDW? We don’t prepare. We are always ready for our next trip. The totality of our preparation before a trip is making DVC and any dining reservations. Beyond that, we take each day as it comes to make the most of our visit “home”. All this changes with taking a group and my preparation is usually limited to helping choose a date and suggest places to eat. With Amy and Ridge, we have built in trip planners. The two of them put together all the plans the trip for us so once again all Mom and I need to do is pack. Thank you for joining me today. Your next stop on the Magical Blogorail Loop is WDW Backstage. Thanks for sharing, Disney Dad! Great post. I can tell you're a pro and have passed it on to your kids! My favorite part of planning is dining, especially since my children are now old enough to have a say and can help in the decision making. Thanks for the great post! I like the fact that you don't need to plan, but that you are always ready. I would love to be close enough to drive; the frequency would be much greater. 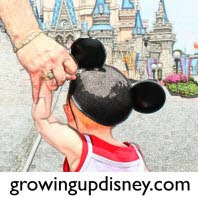 Disney Dad~ I love your approach to planning and packing, wish I could be that carefree :) My family and I are new DVC members since '09 and when I read your generational Blog I get that fuzzy feeling "I want to be like that when I grow up"